Since I’ve already blogged about my first six items for my Spring Sew Geeky plans, this post is a bit redundant, but I figured I’d repost my official Pattern Review 6-in-6 Wardrobe Contest entry here for posterity. Inspiration: At the start of 2018 I had made it my goal to sew with more intention this year. 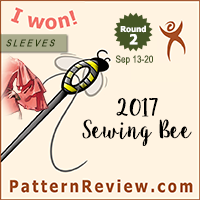 Last year I participated in both the Pattern Review Wardrobe Sudoku Contest and made it to the finals of the Pattern Review Sewing Bee. From the Sudoku Contest I learned that I really liked the idea of sewing a collection (though perhaps not the constraints of sewing to a 4×4 grid), and from the Sewing Bee I realized I really liked having a theme or inspiration to making my garments. So for myself this year I hatched a plan to “Sew Geeky” – I’d make mini wardrobe capsules inspired by my geeky fandoms. I spent January planning out my mini wardrobes – deciding on patterns, and a color scheme, and thinking about fabrics in my stash to use. So when the 6-in-6 Wardrobe contest was announced, it fit nearly perfectly into my preexisting sewing plans, so I decided to enter. For spring, my geeky inspiration was The Hunchback of Notre Dame. I loved both the Disney movie and the book as a child, despite the bad rap it often gets. I wanted to pull colors and design inspirations from the costumes, setting, and general feel of the movie. My full wardrobe plans had more extensive colors and garment options, but for the 6-in-6 I decided to scale back to 1 neutral (black) and 2 accent colors (teal and purple), leaving out the brighter reds, blues, and yellows I had in my full wardrobe plans. All of the items for this contest were part of my initial plans except the topper. Since the goal was not to make full outer wear, I had to find a pattern that would meet the criteria of a “topper” but also fit in with my overall plans and theme. On top of this, I wanted to sew mostly from stash. The only fabric I specifically bought for any of these projects was the tencel I used for the Burda wide-legged pant, the jeans zipper for my Gingers, and the trim for the black Burda top. I actually bought the fabric before the contest started (after I’d made my own wardrobe plans), but it wasn’t ever in my possession long enough to be considered “stash,” and I don’t usually consider notions purchases to be a problem if I’m buying them for a specific project. Conclusion: I am so happy I decided to do this contest! 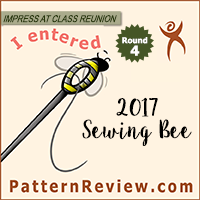 Doing a mini capsule reconfirms my Sew Geeky goals for the year – I loved making all of these pieces! Knowing that they would have items to go with them, and choosing details to be consistent with a theme was so much fun! I do think the one let down in my mini wardrobe is the topper – I enjoy it with the jeans, but I do not think it coordinates quite as well with the wide-legged pants. However, as a standalone item I think I’ll have it in heavy rotation; it is so comfortable! All of the tops are awesome; I’m going to wear the heck out of them. The Burda pants are just so cool looking, and, I made jeans! Overall I think my wardrobe is great, and I plan to extend it as I sew more of my planned Sew Geeky items. I’m so happy that I decided to do this contest – now I have a core of 6 items (12 looks!) that will coordinate with the next several things I make. This has been a crazy 6 weeks, but the end results were so worth it! I love the theme and all the garments you have made for this contest! Good luck! While all the garments look amazing – both in color and shapre, my favorite among these is that teal top!!! It looks really great on you! This is such a terrific collection! It all works together beautifully (and those wide-legged pants are phenomenal). Love your theme inspiration – you’ve followed it through so well and I can see the theme without it being costumey. It’s fabulous. Thanks! That really was my goal – secret geeky sewing! Good work with the sewing, the fit and coordination! Good luck with the contest. I think the reason you don’t like the topper with the Burda pants is because usually the looser the bottom garment, the tighter the top should be. That is why the close fitting tops look awesome with your Burda pants – without the jacket. The topper is lovely on its own. I really love the pants in this collection! They are eclectic yet able to work with all of your tops. Love this set and great job! Pretty nice collection, a lovely colour theme you have going there. Aside from the fact that this wardrobe uses some of my favourite colours, I love the variety of garments/styles you have here.